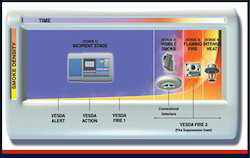 We are a leading Manufacturer of vesda fire detection system and aspiration detector from Ahmedabad, India. An aspirating smoke detector (ASD) is a system used in active fire protection, consisting of a central detection unit which draws air through a network of pipes to detect smoke. The sampling chamber is based on a nephelometer that detects the presence of smoke particles suspended in air by detecting the light scattered by them in the chamber. ASDs can typically detect smoke before it is visible to the naked eye. In most cases aspirating smoke detectors require a fan unit to draw in a sample of air from the protected area through its network of pipes, such as is the case for Wagner, Safe Fire Detection's ProSeries and Xtralis ASD systems.